Villa Cicibella is a newly built unit, located in the quiet settlement Puntera, on slightly elevated position, just 2 km from medieval town Barban, with shop, caffe bar, restaurant, pizzeria, ATM machine and tourist office. Town Barban is known for the medieval play called Trka na prstenac, and also for its preserved heritage, remains of city walls, and Kaštel from the 15th century. Beside all that, this area also offers a varity of activities such as: horse riding, Adrenalin park, Quads. 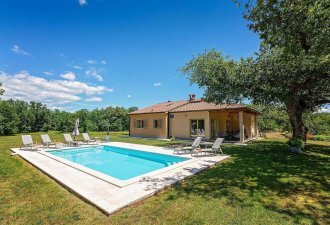 Villa Cicibella extends on compete fenced property of 730 sqm and it is featured with swimmingpool, children playground and spacious covered terrace with BBQ, and two covered parking spaces. Villa with pool for 6-8 persons, extends on two floors on 220 sqm. Groundfloor consists of living room with nice fireplace, dining table for 8 persons, and fully equipped kitchen. This side of the house has exit to the pool and covered terrace. Across the hall there is one double bed bedroom with shower/WC. One more toilette is situated on the end of the hall. Second floor consists of two spaciuos bedrooms. One bedroom is with two separate beds and shower/WC, and the other is with double bed and one extra bed for two. This bedroom has a bathroom with bath/WC. From the upper floor balcony guests can enjoy nice panoramic sea view. Balcony is reachable from the double bed bedroom and the hall as well.